Aplimet offers an exclusive series of customised draught beer towers, a meeting point between technology, art and emotional design that is both attractive and functional. This type of product is designed to express the values ​​of the brand and strengthen the connection with the consumer. We collaborated with our friends from the world-renowned Belgian Brasserie ST. Bernard to create an exclusive and representative dispenser for their precious St. Bernardus beer brand. As the corporate image of the brand, the client asked us to make a dispenser for two taps with its representative figure of the monk. We developed this with our collaborating team of professional sculptors to give shape to the figure of the monk, the identity of the corporate image. With painstaking effort we created an exact replica, but this time giving the requested 3D figure of the monk. With a high level of detail, almost perfectly, and with the painting done by hand, the result is a figure that we could call a work of art. We combined the figure with a stainless steel tube, painted in the corporate colour of the brand. The result and the acceptance of the column in the market have frankly been very good. In recent years Aplimet has been active in this Belgian market for this type of independent breweries that identify with our brand. We present a new column developed exclusively for the Estrella Damm brewery, which is a nod to the beginnings of the brand. In this search for authenticity and roots, Estrella wanted to recover the historical triangular column as a representative model of the brand. The column has been adapted for all the company’s beers, with the logo of each of them: the traditional Estrella Damm, Free Damm, Voll Damm, Bock Damm, Damm Lemon and Estrella Damm Inedit. The beer dispenser we have created is inspired by the beautiful geography of the Canary Islands, an archipelago of volcanic origin that is still active. The design represents the emblematic Teide volcano, the highest mountain in Spain at 3,718 metres, with the detail of falling lava, a highly creative work made for Dorada, one of the leading CCC brands and the most widely consumed in Tenerife. La Zaragozana is an independent brewery located, as its name says, in the city of Zaragoza. Its beginnings go back to 1900, with 117 years of experience in brewing. The brewery sells its products under the Ambar brand. Our work to enhance the value of the brand was to develop a beer dispenser, preserving and enhancing the whole essence of Ambar. We worked on the quality, identification, distinction and connection with the beer consumer, putting the accent on his experience. The dispenser was conceptualised and manufactured dispenser through close collaboration with the client. This allowed us to know their needs closely. As a result, their concerns and expectations are reflected in the final product. For us it is very important to collaborate with Ambar. La Zaragozana is a brewing company in full expansion, with a very ambitious business plan, intended to boost its presence nationally and internationally. Our collaborator Kall Beverage System recommended this tailor-made beer dispenser to one of its main Swedish clients, Åbro brewery. Brygg Mästarens is a beer pump designed from scratch, with a perfect combination of metallic matt gold-finished stainless steel and laser cut with organic shapes. The laser engraving of the brand and its history (on the upper part), gives the tower a well deserved premium beer aspect. The warm interior light makes it a clear favourite. Our Nordic associate Kall Beverage System commissioned us to design a premium tower for one of their main clients, but with retro style. The aim was to keep the deep philosophy of the brand. Its smooth curves achieve a perfect harmony and balance between the two tubes of different finishes. The lighted logo makes it possible to change the brand and use it for the entire range of brands. This modern, light tower design has been created for one of the most famous German brands worldwide. Its elegant, modern lines and the illuminated methacrylate engraved logo combine perfectly with the stainless steel impeccably finish. 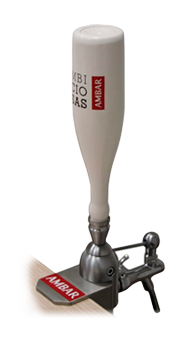 Another famous Belgian beer group asked us for this peculiar beer tower, on which the logo of the brand is fully represented. This “work of art”, specially designed by our sculptress up to the smallest details, is one of the most realistic towers in our portfolio. Brouwerij Bosteels, as is a tradition in the history of our company, commissioned us to produce the dispenser for its best known brand: Kwak beer. Designed with a carved wood base and a body imitating the corporate glass of the brand (made of polyurethane resin metallised in glossy copper and imitation cream paint) they give that unique personality that the brand needs. One of the most important beer brands could only deserve a dispenser of this size. Together with Brouwerij Bosteels, one of our historic clients, we renewed the version of the Tripel Karmeliet tower. This time, the shield of the brand is located at the top and its silk-screened letters on the tube give a different and more modern look. Simple lines favour the display of the brand.